Touhou Genso Rondo: Bullet Ballet Character Poll | NIS America, Inc. So how do you vote? We thought you’d never ask, dood! Simply click the character that you would like to see in Touhou Genso Rondo: Bullet Ballet and your vote will be officially counted! Polls start May 18th and will end in June 1st. 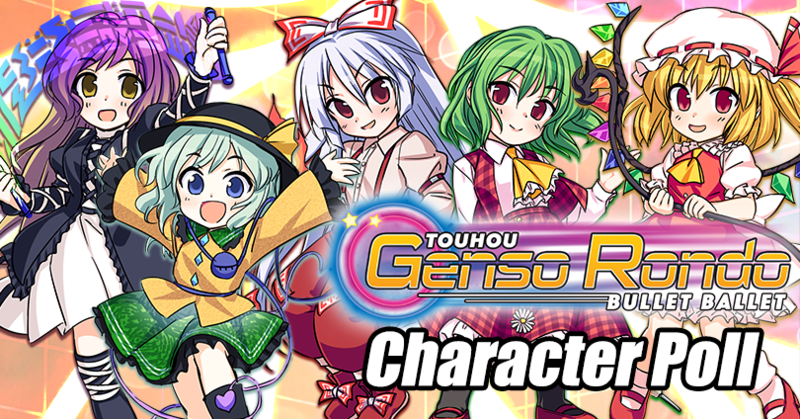 After the polls are closed, we’ll announce the official winner that will be added in Touhou Genso Rondo: Bullet Ballet! You can vote for a character once a day, so make sure to tell your friends to help out and vote. ...oh. And one last thing… We will be randomly selecting one lucky voter with a Limited Edition copy of Touhou Genso Rondo: Bullet Ballet. The more you vote, the better chances of winning, so don’t forget to vote, dood! Head over to the official voting poll and preview each character’s image! Wondering each character's bio? Check out each character's art work and bio below! For more information of Touhou Genso Rondo: Bullet Ballet, scurry over to the official site for trailers, screenshots and more danmaku action! Bio: She has an extreme fear of death. She obtained the power of rejuvenation so that she would not die. That power comes from black magic, not from her traditional Buddhist magic. Bio: She is Remilia’s little sister, and is very attached to her big sis. She is a vampire and a magical girl. She is normally confined to the basement of the Scarlet Devil Mansion. However, she doesn’t even try to leave. Lately, she has become interested in things beyond the mansion, excluding humans. Bio: She is a yokai that possesses a third eye, which allows her to read minds. However, she learned that people disliked her for reading their minds, so she closed her third eye. Since then, she has lost the ability to read people’s minds, but gained the ability to act subconsciously. When she was no longer feared by people, she was also no longer liked by animals. Bio: She is a tanuki of proper lineage. Tanukis love transforming into humans and confusing people, but they rarely cause damage directly. Their powers increase on the night of the full moon. Bio: She is a human who, after drinking the Hourai Elixer, continues to live. Because a human doesn’t age can’t live in the same place as those that do for very long, she kept moving from place to place until she drifted to Gensokyo. She lives quietly like a yokai in the heart of a mountain far from the Human Village. Bio: She is friends with Remilia. Although she is a genuine witch with terrifying power, because she has had asthma (and anemia) since birth, she cannot fully cast spells. It seems she also doesn't get enough vitamin A. Since she believes that she is only truly herself when she is around books, she always keeps books by her side. Bio: She is a rabbit that lived on the moon. She is a master of insanity and apathy. She has a completely different personality during battle. Since she is not from Earth, she has little contact with humans. She changes her personality whenever she wants. Bio: As a sage, she has acquired considerable power. She has attained perpetual youth, which has extended her life. Many people fear that she resorted to various forbidden acts to do so. Because she is not acknowledged in heaven, she has been given the reputation of being a "wicked sage." Bio: She is known as the gap yokai that wakes in Spring. Along with Reimu, she one of the few people who can pass through the boundary to the Outside World. She has the ability to manipulate any kind of boundary. She could easily use her ability to crush Gensokyo if there is trouble. Bio: She is a yokai who lives in Gensokyo. She has the ability to manipulate flowers. Her ability covers things such as making flowers bloom, turning sunflowers to face the direction of the sun, and bringing dead flowers back to life. Despite her pure appearance, like most yokais, she is quite powerful. Her flower ability is simply the cherry on top.